Oh my word. I don’t know what else to say. This was waaaay harder than I thought it would be. The goal was to able to open up two files from different branches and see the changes between them. the git command “difftool” looked to be the secret sauce and everything was working great until I tried to diff a file with a space in the name. That’s when the wheels fell off. 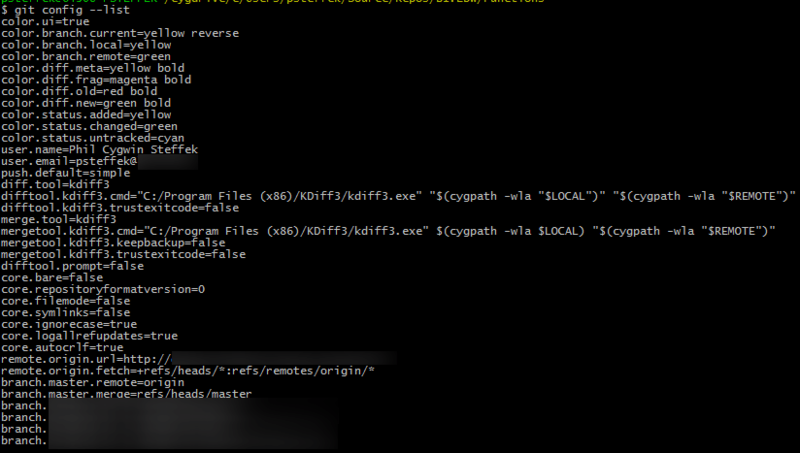 git on cygwin uses its own .gitconfig. It does not use the one at the standard windows path (e.g. “C:\Users\psteffek\.gitconfig”). It uses the one at “C:\cygwin64\home\psteffek\.gitconfig”. And just in case this wasn’t obvious “psteffek” is my username. Replace it with yours. Paths or files with spaces in them make for trouble and need to be escaped. This will help you confirm you are modifying the correct file. cmd = \"C:/Program Files (x86)/KDiff3/kdiff3.exe\" \"$(cygpath -wla \"$LOCAL\")\" \"$(cygpath -wla \"$REMOTE\")\"
cmd = \"C:/Program Files (x86)/KDiff3/kdiff3.exe\" "$(cygpath -wla $LOCAL)" \"$(cygpath -wla \"$REMOTE\")\"
If this helped you at all leave a comment and let me know. Especially let me know if you had to make any changes!